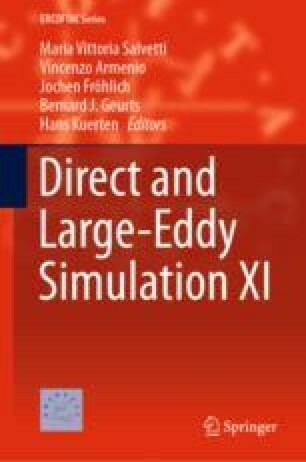 In recent work (Chapelier et al, Comput Method Appl Mech Eng 307:275–299, 2016),  we have developed a variational multiscale simulation (VMS) approach based on a modal discontinuous Galerkin (DG) method. The separation of scales is achieved in each element via projection onto the discontinuous modal space. In (Chapelier et al, Comput Method Appl Mech Eng 307:275–299, 2016), , the DG-VMS technique was applied to the Taylor–Green vortex (TGV) flow at \(Re=3\,000\) demonstrating the potential of this approach to perform LES. This research is partly funded by the European H2020 TILDA project. This work was performed using HPC resources from GENCI (Grants 2016-c20162a7622 and 2017-A0022A10129). We thank F. Naddei for his help with generating the cylinder meshes.